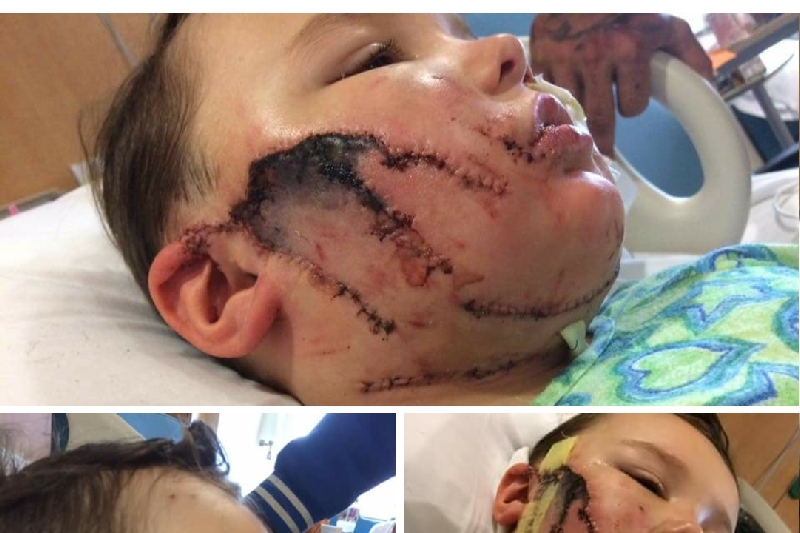 (WISH) — A 3-year-old boy is in the hospital recovering after being attacked by a dog. The attack happened Sunday at a home on the east side of Indianapolis. Elias Hearn, 3, underwent surgery on Thursday for injures to his neck and face. According to Elias’ mother, Stephanie Schofield, the injuries required more than 200 stitches. She said her son has nerve damage, can’t eat or drink, and has lost mobility on the right side of his face. His mother said he will likely need additional surgeries. It’s still unclear exactly how the dog attack happened, but according to an Indianapolis Animal Care and Control spokesperson, the child was at a family gathering and playing outside when the dog bit him and wouldn’t let go. He said several people worked to pull the dog away before police arrived. The 3-year-old was rushed to the hospital. “It is kind of indescribable. It’s like a nightmare you just can’t wake up from and get the images out of your head, and you have to keep praying that your son can find some relief and that he is going to heal properly, and we can limit the amount of surgeries he is going to have,” said Schofield. An Indianapolis Animal Care Services spokesperson said the dog was voluntarily surrendered by its owner and put down. He tells us the owner was somehow related to the child. No citations were issued in this case. The boy’s mom said she wanted to share her story because she doesn’t want anyone else to have to go through what her family is dealing with. Schofield said she has two other children, and friends and family have stepped up to help. A GoFundMe account has been created to help with expenses because she said she can’t work anymore and is spending her time at the hospital. I knew there'd be a gofundme account before I even read the article. The mom wants the kid to be okay, but I bet she's never heard people complain about how dangerous pit bulls are before this attack. This is why PREVENTION is worth ONE MILLION dollars! You can't make your kids whole again nutter people! Once a pit bull gets busy on your child's face, it will never be perfect again. You don't want your kid to suffer? Don't let it play with a pit bull. It's not that complicated! PIT BULLS ARE NOT WORTH IT! EVER! The news story just called it a "dog attack." Animal control said it was unknown what caused the attack. Hmm dog latches on to small helpless prey and won't let go? It took several adults to save the little boy? I knew before clicking on the GoFundMe page that a pit bull attacked the child. That's the only explanation necessary. Whoever wrote the news article made sure not to mention that it was a pit bull's jaws that had to be pried off this precious child's face. Let's just say "dog." The PR ploy won't work if you guys can't get the pit bulls to stop the carnage.